This fabulous sterling bi-metal spinner ring has a secret! This fabulous sterling bi-metal spinner ring has a secret! 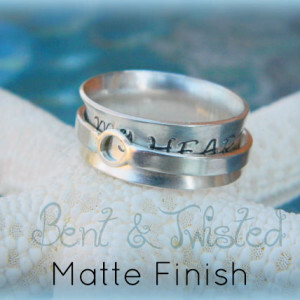 The outer spinner band has a hole in it so you can read the message stamped on the inner ring. No one needs to know it’s there, but YOU’LL know! How cool is that?! 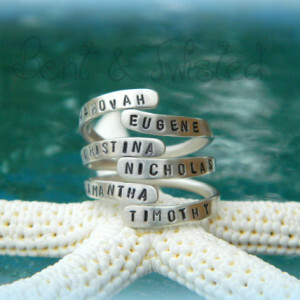 These make GREAT wedding bands too!!! 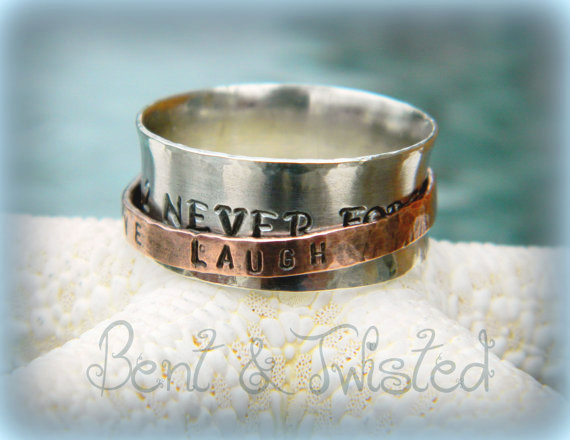 Made from solid sterling silver & genuine recycled copper. The silver inner band is a generous 9mm wide that is flared to hold the 2mm wide outer copper ring in place. The flaring brings the width down to approximately 7.5mm and also creates a ‘comfort fit’ band that is exactly that. COMFORTABLE! As this is a completely custom piece, yours will look slightly different than what you see in the pictures. Due to the nature of these rings, the CANNOT be resized. Please ensure that you give me the proper size that you need before ordering. Custom items are non-returnable/non-refundable. I AM SO IN LOVE! 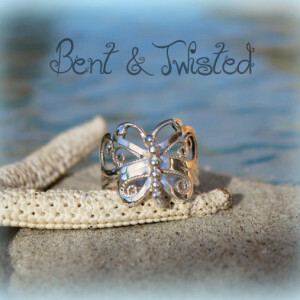 This ring is elegantly handcrafted & very high quality. The artist took care when stamping. 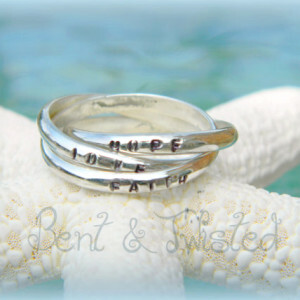 The words are perfectly straight & the soft hammering gives the sterling silver such a beautiful touch. Great customer experience and service! When I had a couple of questions she answered quickly and she was very helpful when I needed help deciding! I will be purchasing again. Thank you so much!